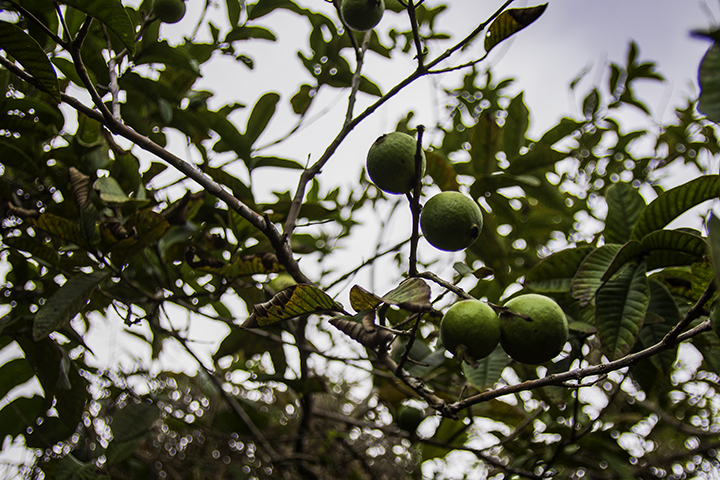 Mountain apples, one of the exotic fruits in Hawaii. The next time you’re there, take the time to try the exotic fruits in Hawaii. Below is a small sample that you can find during your Hawaii vacation. Like many exotic fruits in Hawaii with the name apple in it, the mountain apple is not really an apple. Neither does it taste like one. 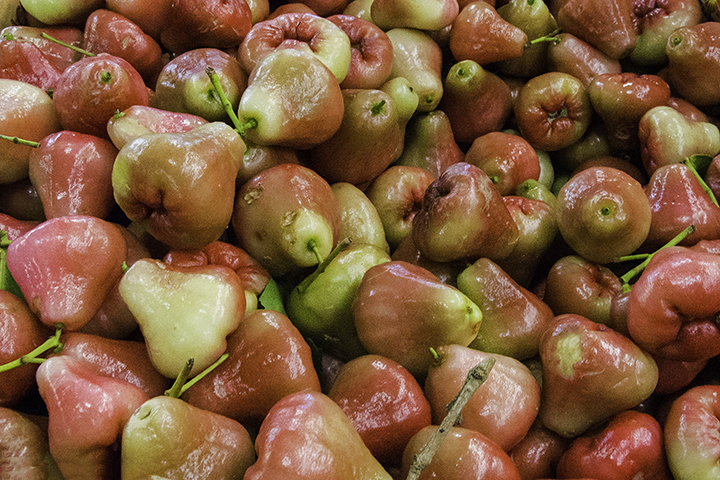 The Polynesians originally brought the mountain apple to Hawaii centuries ago. Most people eat the fruit raw, which is naturally sweet, soft and juicy. Mountain apple fruits vary from deep reddish pink to a softer pale shade. Yellowy-orange and round, a wispy golden leafy cover surrounds these delicate small berries. Because of their unusual beauty, chefs often use the berries as a garnish. As an example, some add them to savory meat entrees, vegetable salads or one fine dining dishes. Also, its sweet-sour flavor is perfect for preserves, jellies, pies or as a topping on sweet desserts. As a result, this makes it one of the more popular exotic fruits in Hawaii. Hikers on mountain paths can often find this exotic fruit readily available. But many consider it a highly invasive species that threatens other native plants in Hawaii. The strawberry guava looks like a ripe pomegranate and tastes like a tart guava. You can eat the entire fruit raw, peel and all, right off the tree. The name of this fruit is rather uninspiring and may be confusing at first blush. This is because its shape does not look anything like an egg. However when you open it, the texture of its bright yellow flesh is similar to an egg’s crumbly yolk. Like the sweet potato, egg fruit has a distinct autumnal flavor reminiscent of pumpkin pie. This could be one of the more unusual exotic fruits in Hawaii. 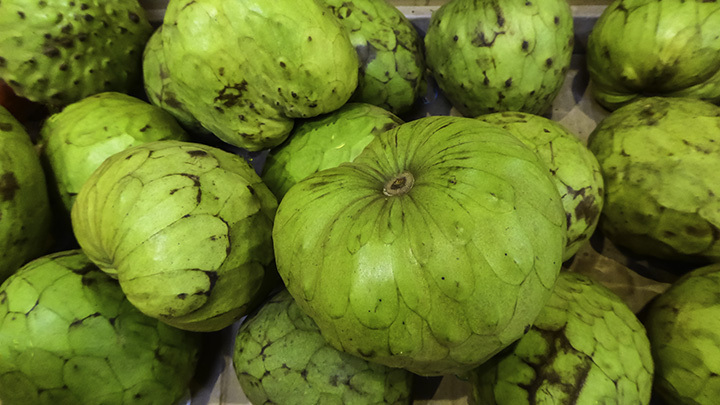 If you were to put strawberries, pear and a banana in a blender, it would taste just like the cherimoya. The oddly shaped fruit looks like a melon, which one can enjoy frozen, chilled or fresh. Famous American writer Mark Twain, once described it as the most delicious fruit known to man. The star apple has many names including milk fruit, estrella, golden leaf apple and more. They are incredibly sweet. Many people chill the fruit before serving it. Some have even used the plant’s leaves as a treatment for diabetes and cold-like ailments. The star apple fruit is usually greenish-brown or purple, with a milky white interior. This fruit looks like a large green raspberry or pine cone reaching 5 to 10 centimeters in thickness. The internal fruit is delicate, white in color and has a creamy, custard-like flavor. The spikey outer layer of this fruit’s peel inspired its nickname, dragon eye. The consistency of this scrumptious fruit closely resembles the lychee. 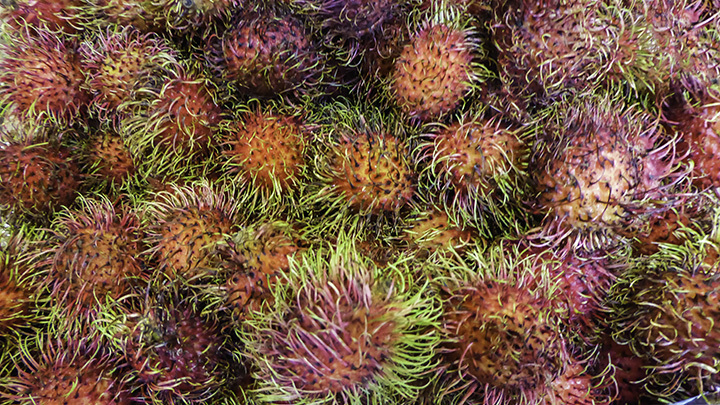 The color of the rambutan ranges from yellow to orange or red. One can find them for sale at roadside stands and in the many farmers markets in Hawaii. 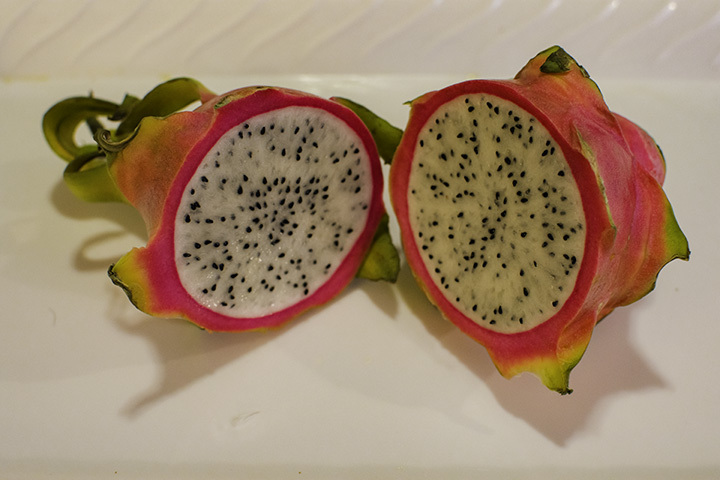 With its vibrant and stunning outer layers, the dragon fruit is aesthetically appealing. The white inside of the fruit has the same texture as a kiwi, speckled with soft black seeds. While its colors suggest strong flavors, this fruit is mild enough for even small children to enjoy. Dragon fruit can be yellow, red or deep purple. Several farms in Hawaii grow them commercially. So when visiting these places, you can even tour and taste fresh samples. This rare berry grows best in higher altitudes and is similar to a cranberry. They are bright red, yellow or orange and can be either very sweet or tangy. These berries can be found scattered all across Hawaii Volcanoes National Park. But the Park Service prohibits people from eating the ohelo berry within the park. This is because it’s a key component of the endangered Hawaiian nene goose’s diet. However, you can sample the ohelo berry by purchasing them at local markets.